SOLD Owl and Athena Tetradrachm Pendant; Please Explore Our Greek Pendants For Similar Items. 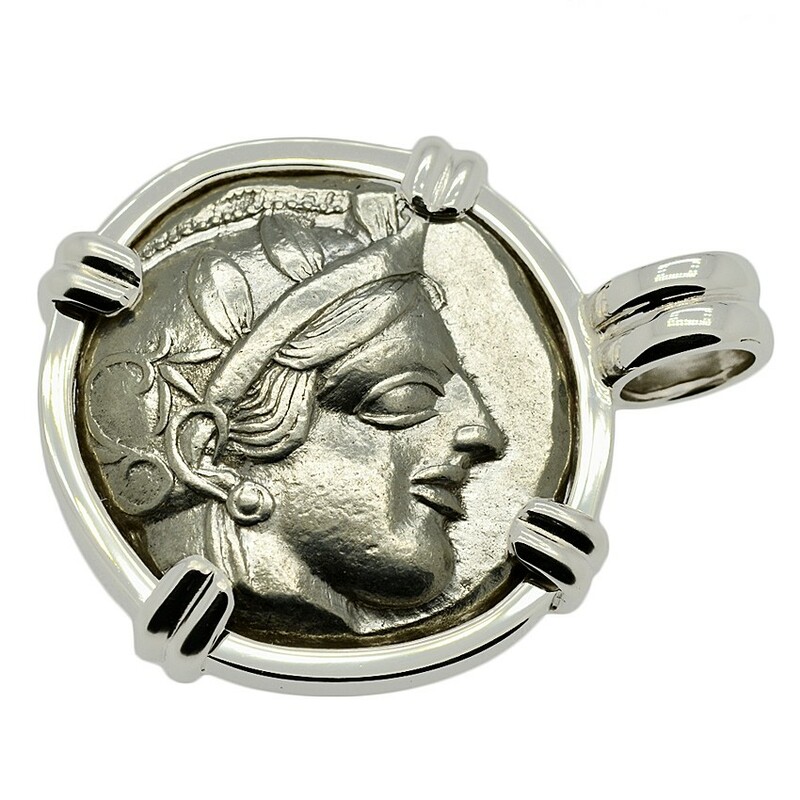 This coin was hand struck in Athens during its golden age and peak of power in the ancient Greek world. A center for the arts, learning and philosophy, Athens was the cradle of western civilization and the birthplace of democracy in 508 BC. 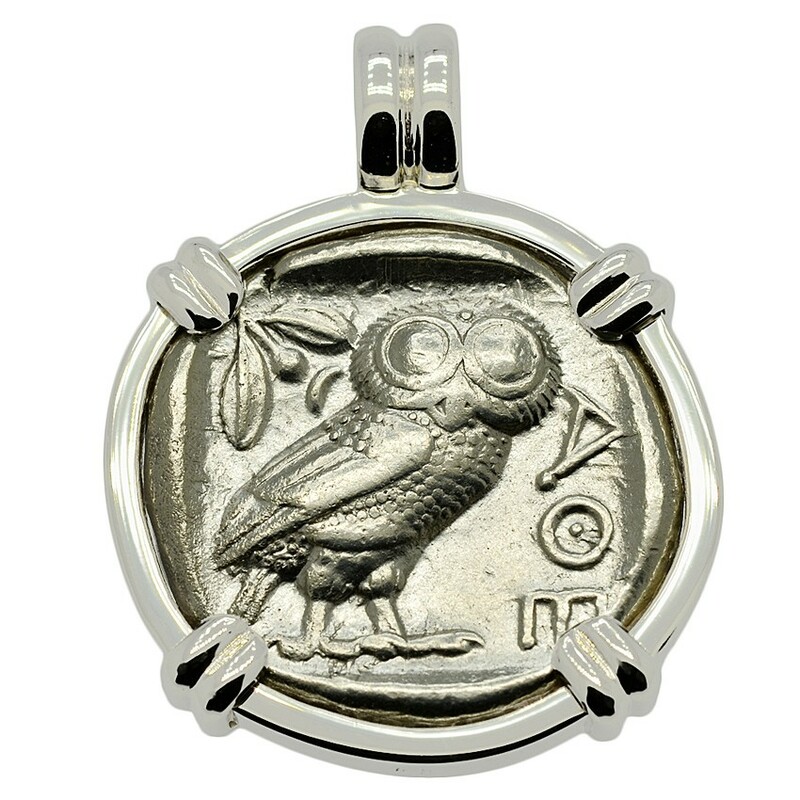 The Athenian Owl tetradrachm was widely used in transactions throughout the ancient Greek world. Athens silver mines provided the silver bullion, the most well known were the silver mines of Laurium. 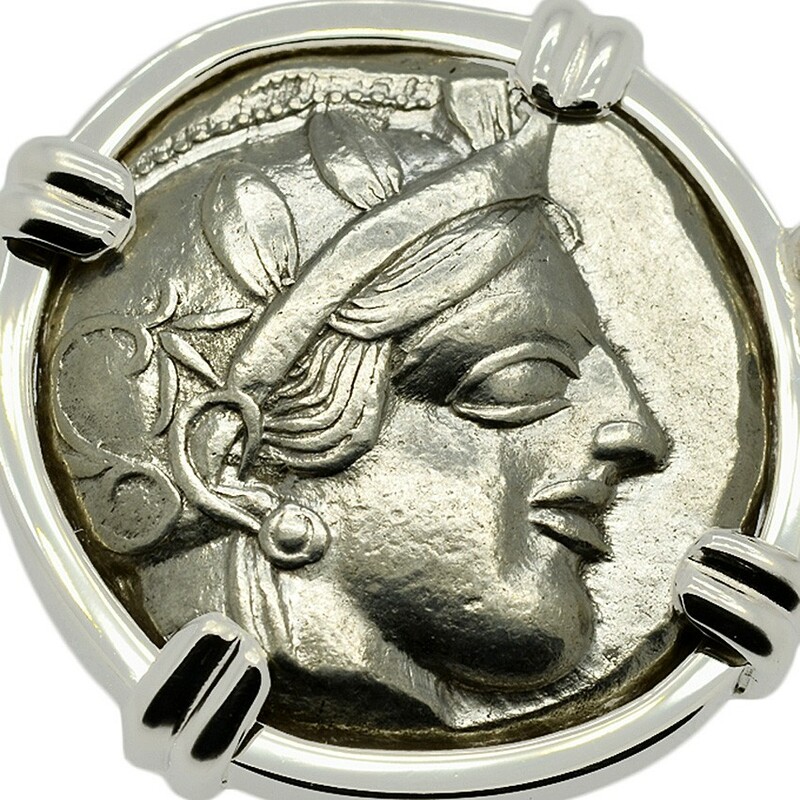 In Greek mythology, Athena (shown helmeted on the reverse) was the favorite child of Zeus and was born full-grown and armored from his forehead. 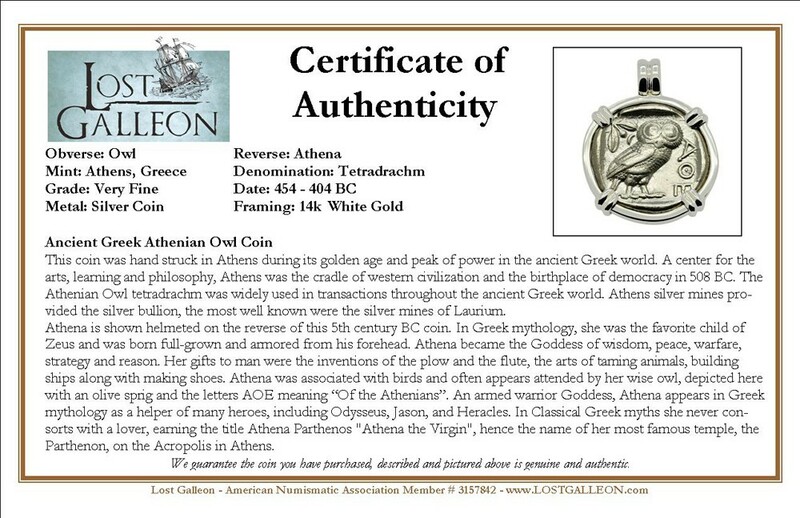 Athena became the Goddess of wisdom, peace, warfare, strategy and reason. Her gifts to man were the inventions of the plow and the flute, the arts of taming animals, building ships along with making shoes. 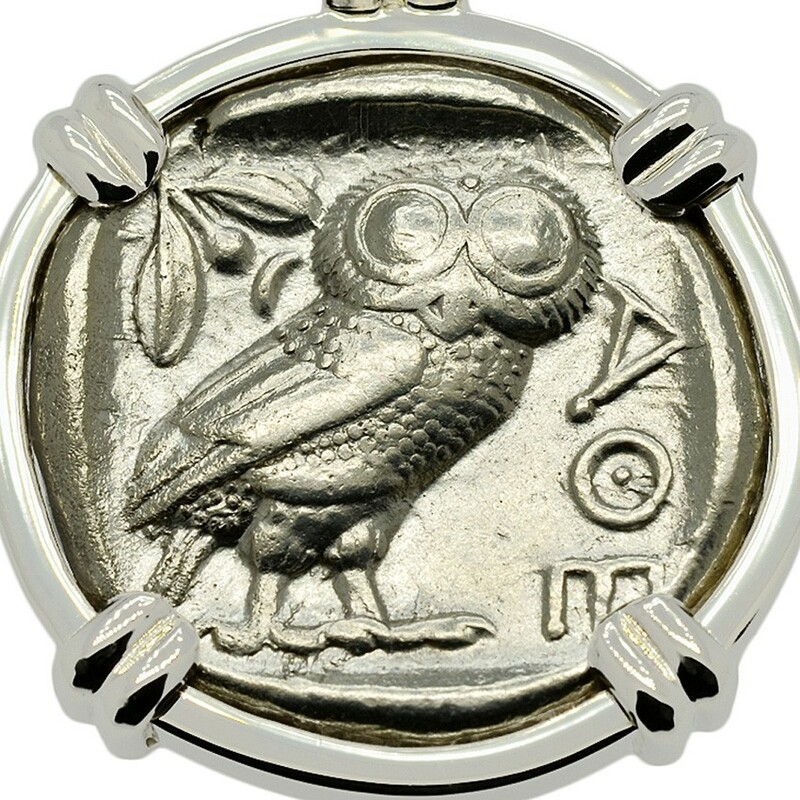 Athena was associated with birds and often appears attended by her wise owl, depicted here with an olive sprig and the letters AOE meaning “Of the Athenians”. An armed warrior Goddess, Athena appears in Greek mythology as a helper of many heroes, including Odysseus, Jason, and Heracles. In Classical Greek myths she never consorts with a lover, earning the title Athena Parthenos "Athena the Virgin", hence the name of her most famous temple, the Parthenon, on the Acropolis in Athens.